Glenrowan Community - Glenrowan Improvers Planning Committee, Heritage Victoria. Tourism Victoria, Victorian Police Museum, Public Record Office. and response to challenges, I immediately said that I'd love to help. and Stringybark Creek with Bill, a design concept evolved as described below. of a Ned Kelly Centre at Glenrowan. of Penleigh Boyd and Bill Denheld. Our aim has been to produce a bold, gimmick free, truly Australian building. It should be modern, minimal, timeless in style and straightforward. It should not be distracting, stylized or a pastiche of the 1880's. timbers, flagstone paving are envisaged. interest. There is a dichotomy in the Kelly legend: hero or villain? 1. Siting of the building over the rail tracks. hotspot can be clicked upon to Preview a magnificent view that can be expected from a 26 metre lookout tower. This view is still 6 metres short, it was taken from the nearby grain silo tower 300 m up the track. You have to imagine a similar but better view from the proposed Ned Kelly Centre located at Lyons Park -but built partially over the rail lines. Click image for larger view. 2.Treating the building as four interlinked pavilions - not a container. (optional), etc. etc. These diverse functions are not all compatible if placed cheek by jowl. Centre needs to be commercially viable and a great magnet for tourism. Our aim has been to segregate the diverse functions into four distinct realms. the creation of the appropriate mood (general ambience, acoustic, lighting) in each zone. In this way, the varying needs and sensitivities of all stakeholders can be accommodated. The four pavilions are in themselves symbolic of the Kelly Gang: Ned, Joe, Dan and Steve. 3. Providing a lookout tower. Glenrowan in context with other Kelly activities. b. Directs people to significant Kelly sites. Wombat Ranges, Wangaratta, Benalla, Ovens Valley, Bright, Mt Beauty, etc, etc. e. Increases tourist appeal to visit the centre. f. Makes the Ned Kelly Centre more memorable. * ( One meter for every year of Ned's life plus 'one' is envisaged. The following architectural sketches are form studies for the use of wood, steel and glass. The light grey surfaces only indicate the form of the building, not necessarily painted surfaces. concept could reflect and honour the bold non pretentious values of our pioneering saw millers. (SOUTH VIEW of the building above). View of proposed Ned Kelly Centre from Gladstone Street. in 1880!). Cars parked as seen at the right of the illustration will not actually be seen. pageants, street theatre, markets or whatever takes the fancy of the people of Glenrowan. (NORTH VIEW of the building above). View of the proposed Ned Kelly Centre from Siege Street. was captured some 120 metres north east. glass inner walls giving a lively view of people ascending and descending from the lookout. 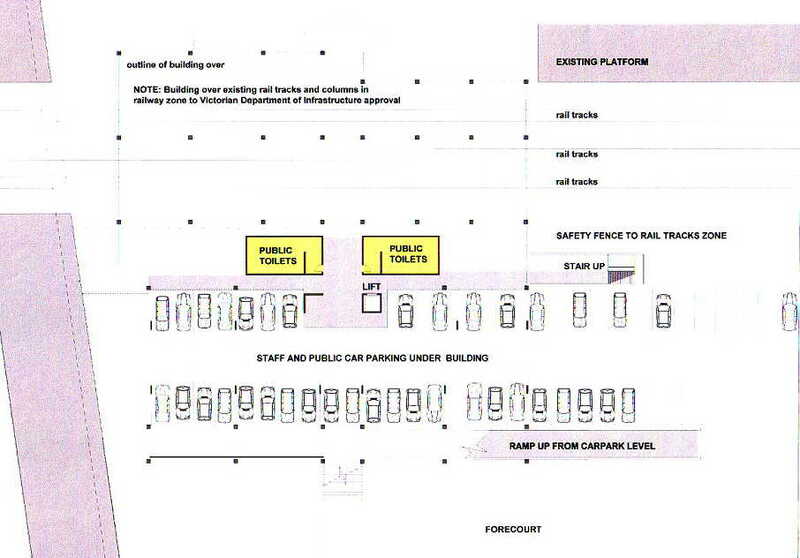 The following CAD drawing shows the carpark area under the front buildings. Note the lift from carpark with optional walk ramps. The carpark is intended to be naturally lit. Safety fences to all track rail zones. by Penleigh and myself on 8 October 2003. The above model is in three parts to allow easy transportation and storage. representing two meter increments. A section of the Hume freeway can be seen lower left. The area covered is approximately 800 x 1500 metres or about 1.2 square kilometre. There is a problem to consider regarding the existing overpass. 1880's time period. Options include building another overpass, but where? modern buildings and houses, bitumen roads and cars all around. options by the community prior to big decisions being made. submission proposal, to be the 'first and best option'. We propose to leave things as they are. approximately one meter of ground level buildup at Siege Street,- down to the original levels. ( be it in the corner, no options here). two at the west end of town. however, progress can continue as no one works project is dependant on the other. over the railway line with the overpass removed. However this is an unlikely scenario. The four following images indicate model view perspectives. indicates relative low profile impact removed and replaced with an alternative close to the building. Ned Kelly Centre at Glenrowan. Copyright: Penleigh Boyd and Bill Denheld. information to the Steering Committee, Glenrowan Improvers and, eventually, all interested parties. assist the promotion of a Ned Kelly Centre at Glenrowan. Please do not hesitate to contact us and thank you for visiting this website. the commercial sector of Gladstone Street. Work is currently being undertaken to put Power lines underground. one would expect the location of the Centre was paramount to those plans ? serious proposal, rather a starting point by the creators of the excellent Feasibility Study. 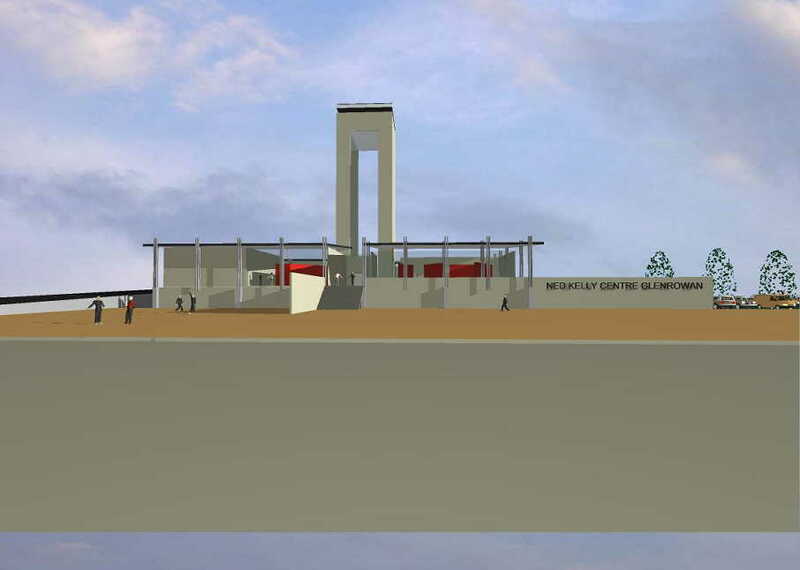 Federal Gov funding to be attracted for the development of Ned Kelly Interpretive Centre. With National Heritage listing, project planning for the building should now become the focus. ask all the people of Glenrowan what they thought of our proposal. 300 residents in the town were contacted with the questionnaire below. and construction of the Ned Kelly Centre. The township of Glenrowan has great significance in the life of Ned Kelly. As you are probably aware, there is a growing movement to recognise Ned Kelly's significance in the story of Australia. Kelly artifacts are continuing to come to light but there is no central place to house and display them or to tell the Kelly story with the dignity, accuracy and lack of bias that it deserves. 1. Do you think that the Glenrowan township should be home to a new Ned Kelly Centre? 3. If a Ned Kelly Centre was to be built in or near the Glenrowan township where should it best go: Main Street 47% as per proposal , the Park opposite the siege site 34%, Opposite the Park - 5% , up on the Hume Highway - 5%, elsewhere - 8%? Please indicate your preference ---- suggestions like - near siege site, over the rail line, Lions Park. Do you think that Council should actively pursue the design and construction of an appropriate Ned Kelly Centre without further delay? [Yes 95% No 5%] Remember, other towns are starting to lay claim to being the appropriate venue for a Ned Kelly Centre. There is talk of removing the Beaconsfield Parade overpass and building another elsewhere. 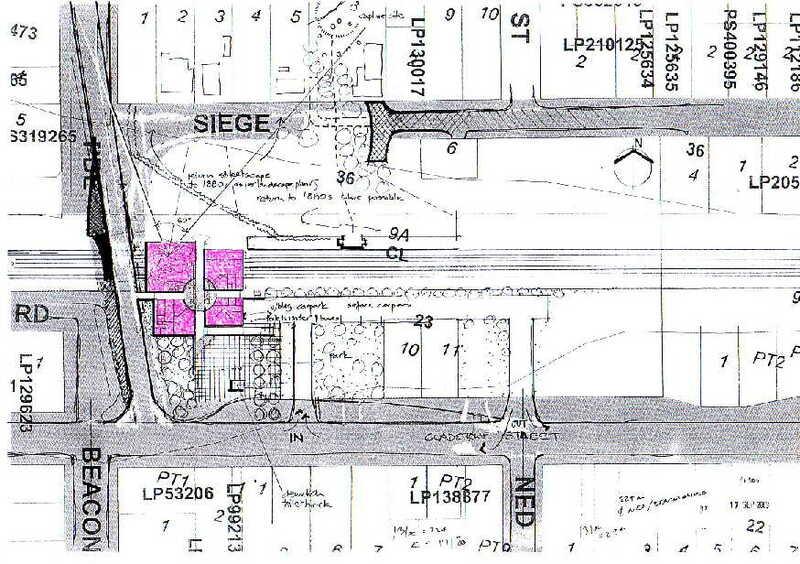 This would allow the Siege Site to be more like it was in the 1880’s with a level crossing at the railway line. Notes; At the time preparing this questionnaire all questions seemed positive and clear. In retrospect, with the results at hand we realise some confusion such as Q 2- Assembly hall- was just a suggestion and is not proposed. 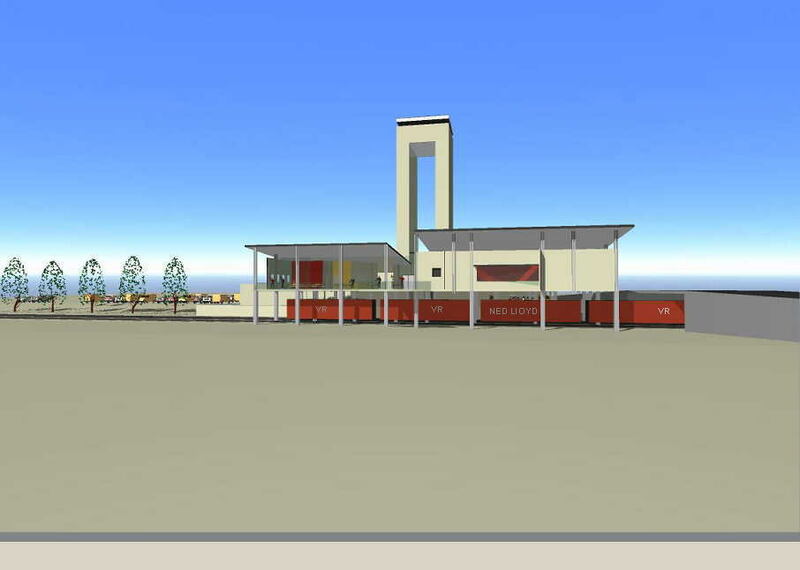 Opinions expressed indicate people are happy with an existing Assembly Hall? but the Market plaza could still occupy the same part of the park as it does now, it would become the forecourt to the NKC, although 65 % voted against such a market plaza? Each line followed by a stop = from one person. Q 2 don't go in competition with local business. Theatrette , Market outdoor. Shop with wares from local area. Make it as interesting as you can. Toddlers play area. Bunning’s, Myer, anything we haven't got. Don't make it like a theme park please ! Include a railway station. Q 3 Hume hwy no ! pref. where the goods shed+ stock loading area were. after style of old shed. Talk to Linton Briggs. Over the rail line. Old service site Benalla end of town, definitely not the park. Lions park. Siege site or lions park. Next to fire station. Beechworth. Historical sign - car, for flow through traffic. Not the highway, it should not be like a theme park !!!!! Over the rail line as your proposal. Near siege site. Over rail line + foot / bicycle bridge. Make play area free part of attraction. Lions park. Any where as long as Glenrowan gets the Kelly Centre. Anywhere. In existing park area. Please consider the purchase of the old petrol station site at the south entrance to Glenrowan currently on the market, this would improve a very ugly entrance from the freeway to town. Not over rail line, on vacant land next to station. Not over railway - opposite side of Siege street. Where the old hall is. The site now occupied by the overpass next to the park. Q 4 Subject to large Gov't funding. Rate payers cannot afford. Q 5 If it does not cross over with existing attraction. I hope so, as long as they don't raise our rates because of it! Q 6 Overpass ? - Foot traffic only where old hwy use to cross the rail line in 1950-s. Yes to overpass but updated - repaired. Overpass yes spend the money elsewhere! Surely this would be too expensive and a big safety. Kelly centre first south end if money allows. Don't waste time on this issue. leave it where it is. Not sure. One block East of present location. The rail crossing must remain adjacent present overpass. Q 7 Affect to businesses ? Yes only if no shop in centre. This is debatable as Glenrowan already receives thousands of tourists each year and would depend on the content of the centre. Some would, others would be ruined if new centre duplicated their business. Yes provided no shop or cafe in new centre. Q 8 Think a free info centre needed = thinking of families + need, for some choices and no cost areas. Don't know. No idea, don't actually live in Glenrowan, sorry not keen on design of centre. The exit from the interpretation (museum) hall should lead directly to the souvenir shop and then exit proper, encourages people to spend, good luck ! Overpass is in a convenient spot wouldn't like to see it changed. The building design would be the odd building in town - needs to blend more - less rigid. Over rail track, lookout tower no. This letter is a good idea. Do not like the proposed building, it's to modern + yuppie, why not stick to the basics. It needs a country look. Fresh design badly needed. Go the lot big banana, big Pineapple etc, but who develops. Any proposed building should not be modern as the proposed plan, council said this was many years off, Design: roofing suggestion: either match or invert the col or saddle in which Glenrowan located. The present shop owners should be given the opportunity and first option to be involved in the ( new centre) trade. Thank you to all the town's residents who participated in the above Questionnaire. Committee for the project. Late arrived mail input will be factored in to the final outcome. "There are good reasons for the building looking like it does. The first and most important reason is that the building is an honest response to our time and the functions which it has to perform. We have designed the building to reflect Australia as it now is. Even though we are commemorating events of the 1880s there is no good reason to pretend that we are still living in those days. People will not arrive in Glenrowan by steam train or horse and carriage, they will not expect roaring fires to keep the Centre warm on winters days, nor kerosene lanterns to light the displays, nor cafe food cooked on an open fire and they will not expect pit toilets out the back. Visitors to the Ned Kelly Centre will expect an up to date building with all the modern technology that we as a community can offer in 2005. Now, it is our feeling that if we were to provide an up to date building with all the modern technology on offer but make its appearance look somehow not modern then it would be a sham of a building - something quite dishonest like you might find at Disneyland. We do not want to fool tourists into thinking the building is something that it is not. The building will have come along some 125 years after Ned Kelly's death and it should not pretend otherwise. Secondly, we must remember that, in the spirit of Ned Kelly, he was a modern man who moved with the technology of his time, even though it was the 1880s. His use of the modern media - (newspapers) to get his ideas across, his adoption of armour (after reading about a battleship that had just adopted its use) and his desire to access the latest in firearms technology shows that he didn't hanker for the past. What would he have thought of our times? Would he have embraced the latest technology as he did in his own day? We have responded to such concepts." concept design proposal since 2003. The 'mixed response' refers to Council's lack of response and not the results. mainly on the basis " the design is located across a National freight line between Melbourne and Sydney ". of course paramount, but is demonstrated to be not an issue with this type of building development. 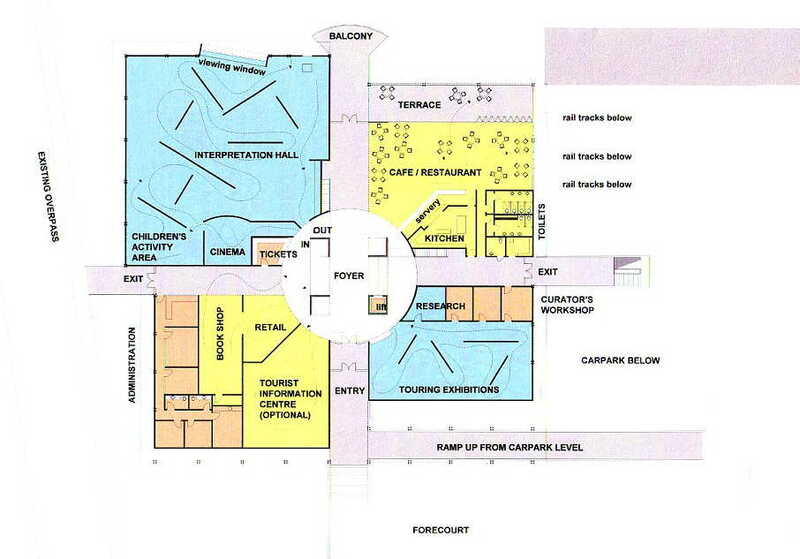 of a design for the Ned Kelly Centre. updated 14 Nov 2006 regarding the landscape model now at the Old Police Station rooms.